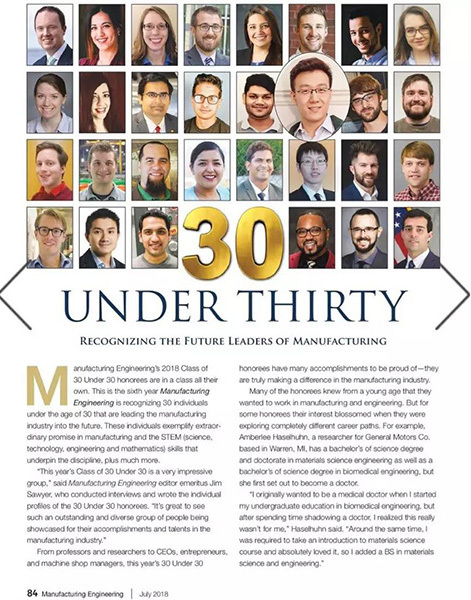 The University of Michigan- Shanghai Jiao Tong University Joint Institute alumnus Dr. Zongchang Liu, CTO (chief technology officer) of CyberInsight was selected as one of the 30 most influential outstanding young manufacturing engineers to the future of America’s manufacturing engineering, according to the 2018 list of “30 Under 30” (30 outstanding young manufacturing engineers under the age of 30) unveiled by the US-based Society of Manufacturing Engineers (SME) on the “Manufacturing Engineering” magazine recently. The SME’s “30 Under 30″ project was launched in 2013 to recognize and encourage young people who can bring about changes in manufacturing. Each “30 Under 30” honorees cannot be selected again and the applicants have to be under the age of 30, who have shown enormous potentials and abilities in promoting the development of manufacturing industry or supporting manufacturing related subjects such as STEM (science, technology, engineering, mathematics). All the “30 Under 30” honorees this year have achieved extraordinary success, whether they are professors, researchers, CEOs, entrepreneurs or workshop managers. They can truly make a difference in manufacturing. CyberInsight is a leader in industrial intelligence practice. They target to build 100 worry-free industrial scenes within ten years in the vision of “Enabling Work-free Industrials”. The main team consists of engineering doctors from the IMS center (Center for Intelligent Maintenance Systems) and they deliver service from product to capability for customers through the integration of the model-centered whole stack industrial intelligence scheme. As the CTO, Zongchang Liu is responsible for the strategic layout of the company’s products and core technology development. He leads the team in the integration of computer science, intelligent algorithms and industrial domain knowledge. They have already developed the industrial intelligence system based on industrial intelligent modeling and analysis platform, Genpro, the enterprise model service environment, Cybersphere, the industrial networking and edge intelligent platform, Edgepro etc., enabling industrial enterprises to obtain the worry-free industrial system for the future. Zongchang Liu graduated from JI as an undergraduate. During his four years at the university, he not only obtained a bachelor degree in electrical and computer engineering, but also minored in global health care design. 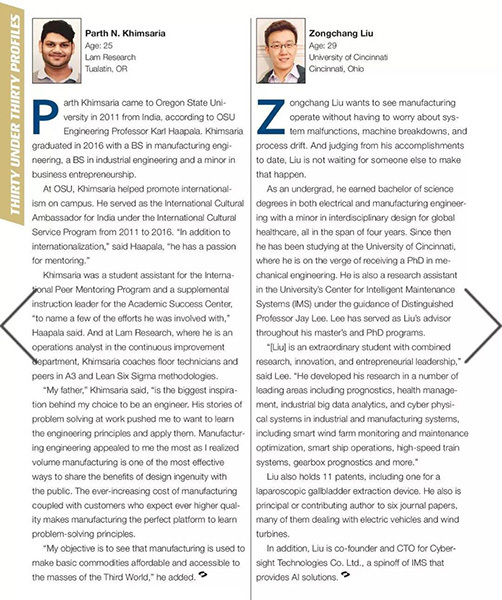 He then obtained a Ph.D. in mechanical engineering from the University of Cincinnati under the guidance of Professor Jie Li, and served as the research assistant to the American Center for Intelligent Maintenance Systems (IMS). He currently has 11 patents (including laparoscopic cholecystectomy) and has published six journal papers as lead author/writer in fields such as electric cars and wind turbines. As a 2012 JI alumnus, Zongchang Liu is passionate about JI’s alumni work, and is currently the president of JI’s alumni association. Since its establishment, the alumni association has held regional and industry activities in Beijing, Shanghai, Michigan and Silicon Valley in the United States, and has made some achievements in supporting the development of the joint institute. He is also enthusiastic about community work and pays attention to inheritance. He set up a industrial data club in the institute to promote industry exchanges and to provide a learning and development platform for the students. “Ever since I entered university ten years ago, I have been expanding my boundaries of cognition and competence in new areas, and have been fortunate enough to see many attempts to take root in industry with success. All of this can be traced to the seed JI sowed in my heart, entrepreneurial spirit. This spirit rejects the comfort zone in life and gives us courage to face the unknown and the uncertainty in the new domain, which allows a wider world and possibility in our life. I feel the meaning of this spirit more and more from the two years of experience in entrepreneurship. In addition to imparting my knowledge and ability to acquire knowledge, JI endowed me with the spiritual wealth that I will benefit for a lifetime. May this power be turned into a spark and spread to every corner of the world by the people of JI,” said Dr. Liu.